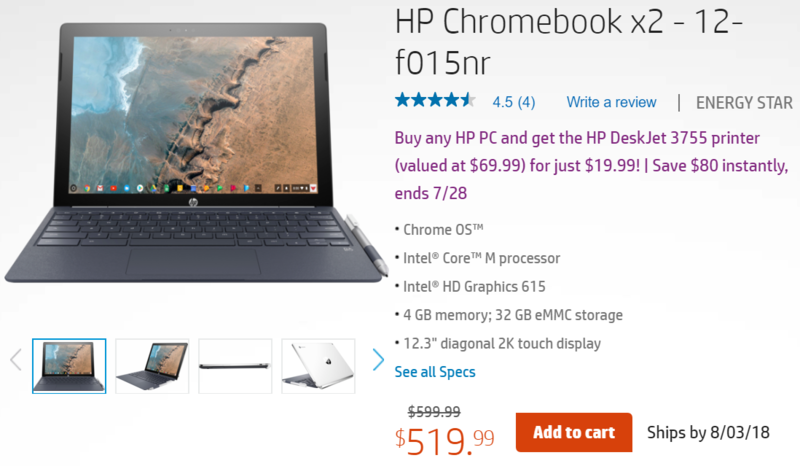 HP's Chromebook x2 was the first Chrome OS-powered detachable, and although it was an interesting novelty (and probable future for the platform), the $599 asking price may have been a bit steep. Not long after launch, it went on a small $30-off discount, but as of today you can pick one up for a more sizable $80 markdown, sold directly from HP. We haven't checked out HP's x2 for ourselves just yet, but on paper, it seems mostly comparable with other high-end Chromebooks, with a last-gen Core M3-7Y30 CPU, 4GB RAM, 32GB of eMMC storage, 12.3" 2400x1600 IPS display, dual USB-C ports, and a 48Wh battery. While those specifications should be fine for most people given the Chrome OS environment, if you're interested in checking out Linux applications/plan to do any heavy-duty work via Crostini, the 4GB of RAM could be a limiting factor. Of course, it also has a unique detachable design, giving it a tablet's form factor on demand. Still, $520 isn't a bad price if you need something with a more tablet-like experience. The associated $80 discount from HP looks set to expire on 7/28, so you have a bit of time to think about it. Either way, it won't ship for almost two weeks.